Linwood care home in Thames Ditton has joined up with Chiswick House and Gardens to “MakeADreamComeTrue” for resident Margaret Reed. Linwood care home regularly look for ways to make a difference to the lives of residents living there, and their “MakeADreamComeTrue” project is currently working to create special memories based on personal interests and memories. Born in a village called Chipstead near Banstead, Linwood Residentn Margaret Reed was born in the school house that her father was Headmaster of at the time. Her mother was also a teacher, she stopped working when she had Margaret but was regularly called up during the war to teach as a supply teacher. Margaret recalled that her mother was great at drawing and if she wanted to silence her class would draw beautiful pictures on the board. Although Margaret grew up saying that last thing she wanted to be was a teacher, fate had something else in mind for her and after passing the 11+ Margaret attended Tiffin Girls School in Kingston. She recalls that her teachers were very good and it was them who changed her mind about teaching, encouraging her to become an English teacher later on in life. Margaret went on to teach in a school in Stoneleigh, where she met her husband. When Margaret retired she joined a number of organisations which saw her visit many historical houses around the country. So when the team at Linwood care home asked Margaret to tell them what she considered being her dream day out, Margaret instantly told them she would love to visit a historical house. 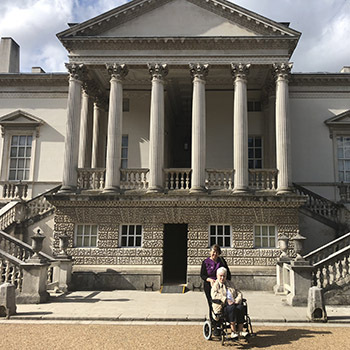 The care home team spoke to nearby Chiswick House and Gardens to arrange a trip for Margaret and the historical house kindly donated tickets for her to visit and spend the day admiring the architecture and beautiful gardens. Find out more about Linwood here.